Dedicated to one of the most significant artists ofthe Vienna secession and precursor of modernism. His works like "the Kiss" are masterpieces become icons worldwide. 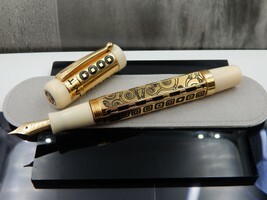 Santini Italy pays tribute to the grandeur and fantasy of thisgreat artist creating a four-sided pen. Enclosing the shapes, colors and all the charm of exclusiveand unique art of Klimt. The body of the pen is completely decorated by hand. 33 pcs solid 925 silver. Cartridge/converter filling system.